All children need to eat well to stay healthy and to grow well. Eating well means eating the right balance of a wide variety of foods. For children who have cancer, eating well is especially important. There are common problems that children with cancer have when it comes to eating well - see these listed below. You should always contact your dietitian if your child has any eating problems. When your child is ill, you may need to adjust their nutritional needs such as their calorie intake. Your child's dietitian will give you advice about this. 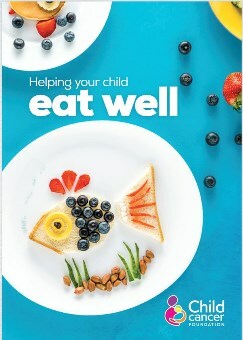 See the Child Cancer Foundation ebook - Helping your child eat well. Does anything in food cause cancer? No. Many parents worry that certain foods their child has eaten may have caused the cancer. There is no evidence that this is true. There is some thinking that there is a link between some adult cancers and diets that are low in fruit and vegetables. But, there is no evidence that food has any effect in childhood cancers. Can a special diet cure cancer? There are claims that certain diets or dietary supplements can cure cancer but the information can be misleading. It is important to discuss any special diets and dietary supplements with your doctor or dietitian who will help you. What are the best foods for my child who has cancer? As with any child, your child needs food from each of the groups in the food pyramid. Children having treatment for cancer need more calories and nutrients than normal - your dietitian can give you advice about this. If your child has lost a lot of weight or has not been eating very well for a while, they may need tube feeding for a period.